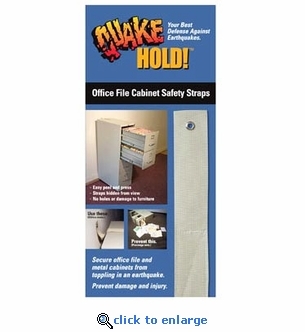 Prevent accidents at your workplace or home office with this file cabinet strap. This easy to use anti-tip strap will secure a standard four drawer vertical file cabinet to a wall stud. Press adhesive side of Velcro strip onto the top middle of the cabinet, secure the other end into the wall stud through the grommet hole with supplied screw. One kit is needed for each file cabinet. Anti-tip fasteners prevent top heavy file cabinets from tipping over.